I don’t want my chicken post to get drowned out by this yogurt post but a few people have asked me about homemade yogurt and I was eager to share it with you, so if any of you know anything about chickens scroll down one more post and give me your tips on chickens and then hurry and scroll back up and make some delicious homemade yogurt. This is hands down a huge favorite at this house, I love it, my husband loves it, and my kids LOVE it. I have to thank my sweet friend Mel for this one, she brought me over a quart of homemade yogurt last fall and it was so delicious I decided I better try making it myself, I had tried once before and failed miserably, she gave me the recipe and a few instructions and I decided to give it a go again because the yogurt she gave us was SO good. I tried her recipe and the first time I was successful and I have been making my own yogurt ever since (I make it every Monday, very religiously, someday I’ll share with you my weekly schedule, but another post for another day). I love that this yogurt is so pure and I know exactly what I am feeding my kids it means a lot to me, plus from scratch food is almost always better for you, and it usually tastes so much better too. The good news is making yogurt really isn’t hard, and I mean that, it takes a bit of time but really waiting mostly. You can do it I promise. Here are a few things you’ll need to get started, things that aren’t expensive and once you have them it will make your yogurt making a breeze. You may even have them in your kitchen already. Here’s the list and when you see the recipe you’ll see why you need each one. A food thermometer, here is the link to the one I have, I know there are a lot nicer ones out there but this works perfect for what I need. I read the reviews and liked the sounds of it plus it was cheap and it hasn’t failed me yet. Cheese cloth, or I really prefer these nut bags, I have never used cheese cloth because I found these while I was searching for cheese cloth and they got great reviews plus I like that you can make nut milk with them if you want and I have even used them to wring out Zucchini, I really like the endless possibilities, but since we are talking about yogurt here they are perfect for that. I have 2 so I can strain my whole batch of yogurt at the same time. A large pot like this, this is the one I have but you don’t need to buy this one you just need one that will fit a gallon and a half of milk or even a gallon if you want to make a smaller batch. 7-8 canning jars hopefully you have these laying around gathering dust and now you have a need for them, but here’s a link if you don’t or you can buy them at your local grocery store. I love, love, love these plastic canning jar lids (which I already did a post on) they are so handy when making yogurt, I like using wide mouth jars but you can use regular if you’d like. cooler, everyone has a cooler right? If you don’t here’s a link for one, but I am hoping you already have one. Yogurt starter, the plain Greek yogurt that comes in a 2 pack from Costco works perfect (i’ll post a picture for reference) and once you’ve made the yogurt once you can use that for starter the next time if you’d like. If you don’t have a Costco nearby you can look at your local grocery store for yogurt that doesn’t have anything but milk and live active cultures in it like Lactobacillus bulgaricus, Streptococcus thermophilus, Lactobacillus acidophilus, (weird names like that) you just want milk and those live active cultures in it. Nancy’s brand is a good one too. Milk, different brands make a difference in taste, my favorite is Costco’s milk but you can use whatever you have on hand or whatever brand you normally buy. I use whole milk when making yogurt, I like my yogurt creamy and I like whole milk for my own reasons, but use 1% or 2% if you’d like, they will both work. I don’t know about nonfat, give it a try and let me know if it works. Please don’t let the things you need intimidate you, you can do this I know you can. Most of that stuff you probably already have in your kitchen and if you don’t just buy the couple things you need and let’s get started. Here’s the recipe and the step by step process, and then I posted some pictures below to show some of the process. 1 1/2 gallons of milk, I don't measure I just eyeball this (you can do a gallon of milk if you want to make less, a gallon will make roughly 2-3 quarts of yogurt depending on how long you strain it and a gallon and a half will make closer to 4 quarts of yogurt depending on how long you strain it). I always do a gallon and a half or even more sometimes but we have a big family. 1 C of sweeter I prefer using organic cane sugar from Costco (i'll post a picture) but you can use agave, regular sugar, whatever you'd like best to sweeten it with. Reduce the sweetener just a little if you use 1 gallon of milk, I'd say to 3/4 C of sugar. Pour the milk into a large pot and turn stove on to medium heat, stir often, you don't have to stand there the whole time but be sure to stir often, I have burned the milk before and the yogurt tastes terrible when this happens. 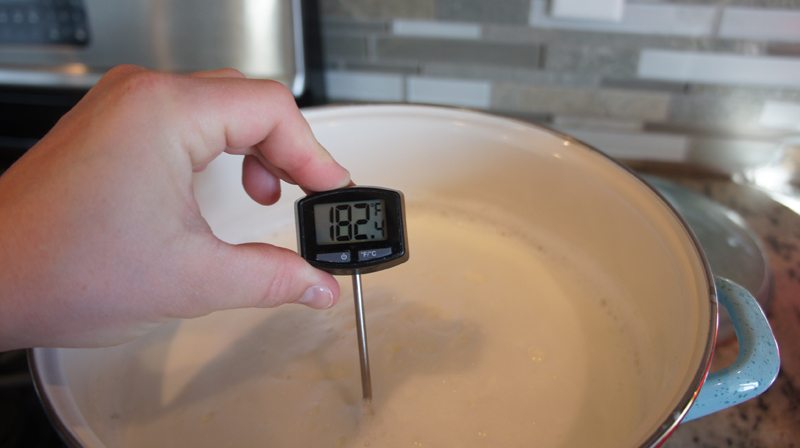 Heat the milk to 180 degrees, this is where your thermometer comes in handy. Once the milk is heated to 180 degrees remove it from heat and add the sweeter and vanilla. If you want the yogurt to be plain yogurt, don't add the vanilla or sweetener. Let the milk cool to 120 degrees (again use your thermometer, testing it periodically to know when it has cooled to 120 degrees). After it has cooled to 120 degrees put about a half cup of yogurt starter in a bowl and scoop out one or two cups of the warm milk into the bowl with the yogurt starter whisk until it is smooth and then pour into the pot with the warm milk and whisk all together. 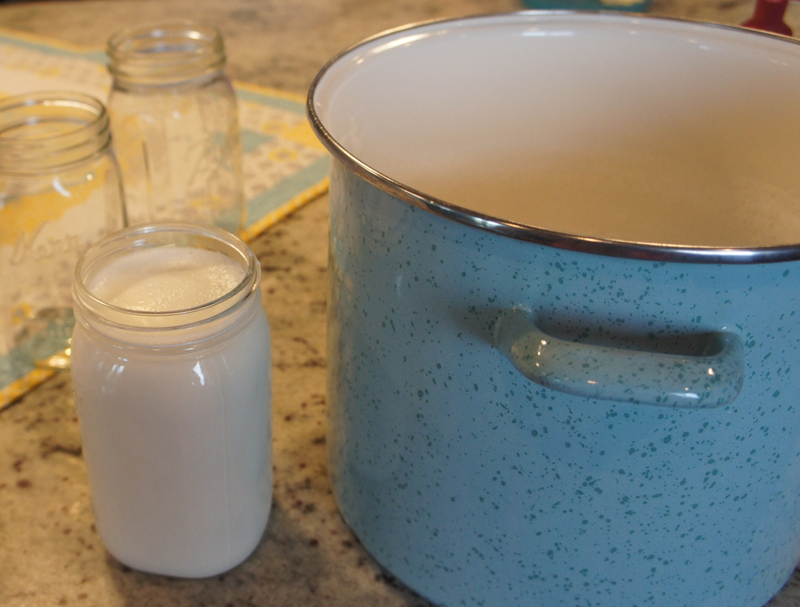 Pour the warm milk into 7 canning jars and seal with the plastic or metal lids, make sure they are pretty tight so water doesn't get into the milk. Set the jars in a cooler. Let your tap water run until it is as hot as it will come out of the tap and fill the cooler up to just under the lids of the jars with warm water, the water should be between 120 degrees and 110, if it cools off more than this during the process remove some of the water and put more warm water in, sometimes I microwave some of the water to make it just a bit warmer, not all of it though you don't want it to be to hot. After you pour the water in the cooler shut the lid and let the yogurt incubate for 8-10 hours, checking half way through to make sure the water has stayed warm enough. Once the yogurt has set you can strain it (you can tell when you tilt the jar and you see that the milk has gotten thick, or unscrew the lid and check it, you'll be able to tell). 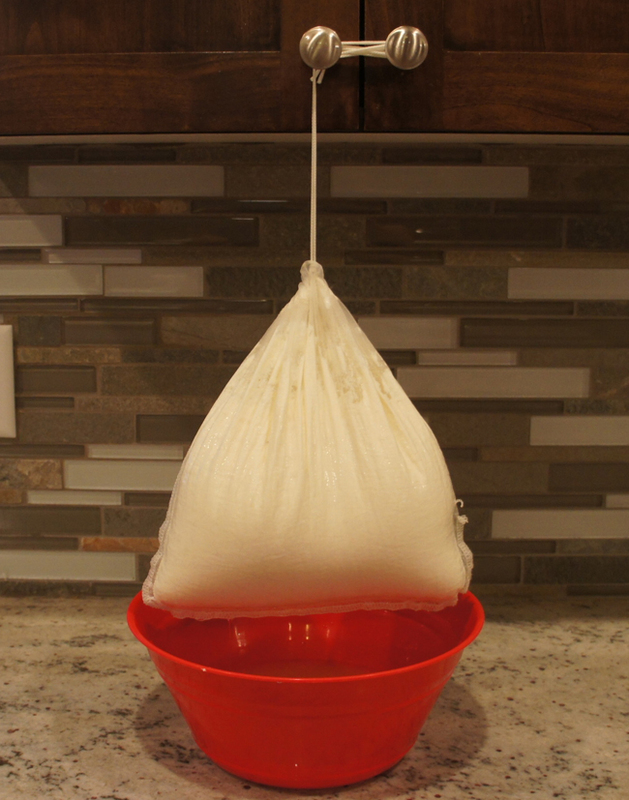 Strain the yogurt, do this by pouring the yogurt in the nut milk bags 3 quarts in one and 4 in the other, I hang the bag from my kitchen hardware on my cabinet doors, but you can hang it anywhere. Strain over a bowl. After about 30 minutes pour the yogurt in a bowl and whisk until desired consistency is reached. 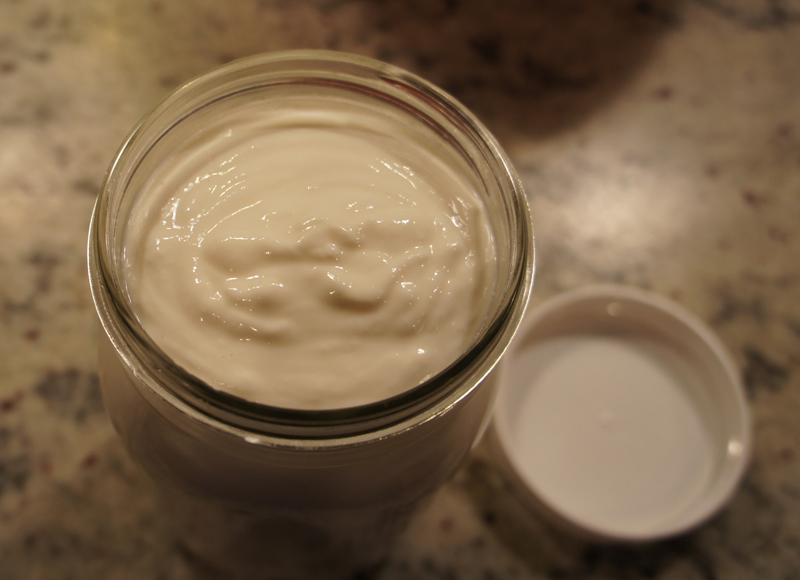 pour or spoon the yogurt into clean canning jars and top with a lid. Put the yogurt in the fridge to cool. *The liquid that has strained off the yogurt is whey and I save it most of the time, it is a great substitute for buttermilk or milk in pancakes or waffles or any recipe you would use buttermilk in, just remember it's a little sweet (if you added sweetener to the yogurt) so don't use it in a recipe you don't want a little sweetener in. Here’s some pictures of the process to help you visualize how to do it. Heat the milk to 180 degrees (okay so I went a little over). After it reaches 180 degrees turn off the heat and move the pot to the counter and add 1 Tablespoon of vanilla and 1 cup of sugar (a picture of the sugar I use is at the bottom of the post I really like this organic cane sugar, it’s a little better for you than regular sugar and it is exceptionally delicious in the yogurt. I got mine at Costco but you can also buy it here on Amazon) or you can use agave or regular sugar. Let the milk cool to 120 degrees. Put half a cup of yogurt starter in a bowl and spoon out some of the warm milk into the bowl, whisk until smooth and pour back into the pot of warm milk and mix. 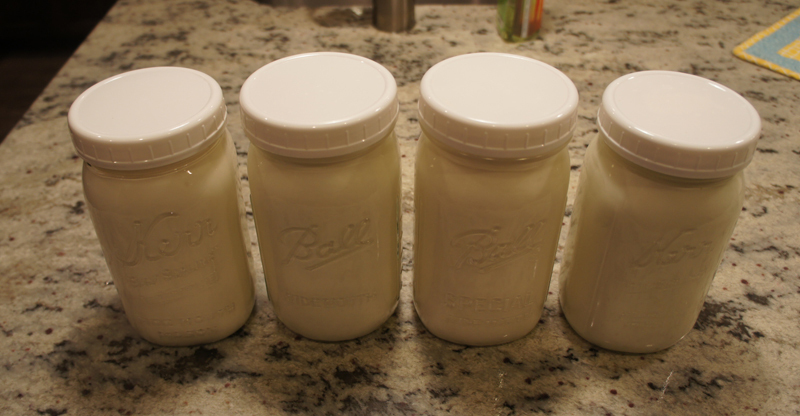 Pour the milk/yogurt starter mixture into 7 canning jars. 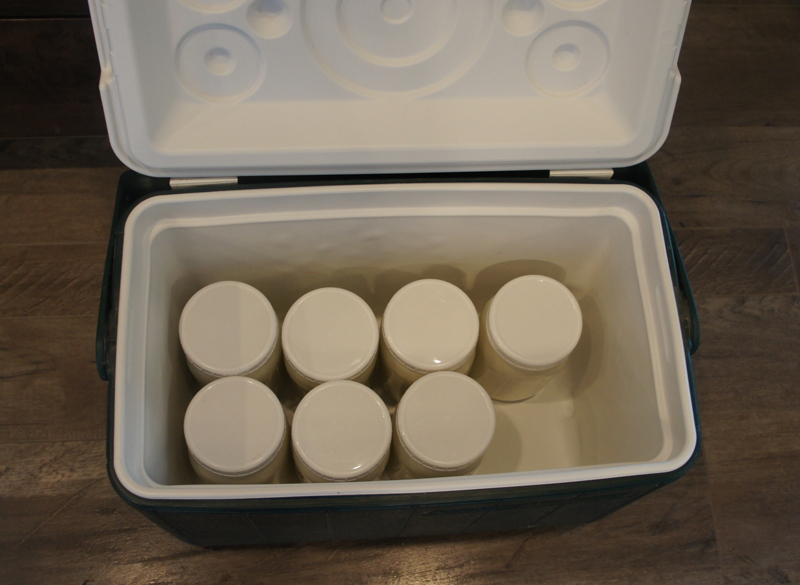 Put the Jars in a cooler and fill with as hot of water as you can get out of the tap. Don’t let the water cool to less than 110 degrees curing the incubation process, check it at about hour 3 or 4 and if it has cooled below 110 degrees take out some of the water and add some new warm water. Shut the lid and let the yogurt incubate for 8-10 hours. Once the yogurt has set up (it’s pretty obvious when it has set up to check just unscrew the lid and you can see it’s taken on a custard consistency) dump the jars into the nut milk bags to strain for about 30 minutes, longer if you want your yogurt thicker. I can get 4 quarts of yogurt in one bag but it is super full to the top but it works great just be careful when you are dumping in that last one. When it is strained empty the yogurt into a bowl from the bag and stir with a whisk until desired consistency is reached. Spoon or pour the yogurt back into a clean quart jar and top with a lid and refrigerate. You can top the yogurt with fresh fruit, granola, whatever you’d like. My kids like to mix in homemade strawberry jam, it’s vanilla flavor so it tastes delicious just like that too. Enjoy, and tell me what you think. This all may seem like a lot of work but really give it a try I mean it when I say it isn’t that hard and it’s so worth it, I don’t have time on my hands to spare and I know you don’t either but I really think you’ll find that this really isn’t that hard and it will be so worth your time. *one more quick note… What you strain off from the yogurt is Whey, don’t throw this away, it works great in pancakes, waffles, frosting anything where you would use buttermilk just remember it is a little sweet so you don’t want to use it in a recipe where you don’t want a sweet flavor in your buttermilk. 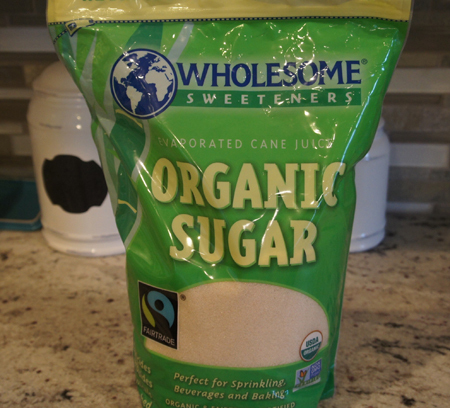 Here’s a picture of the sugar I use, you can get it at Costco, or on Amazon here. 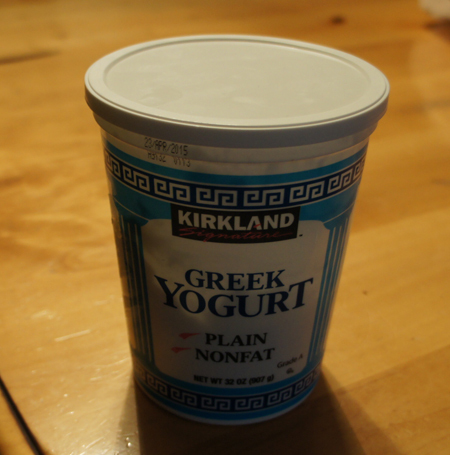 Here’s a picture of the yogurt starter I use, it’s from Costco. You’ll find out quickly that Mel is one of my favorites. I have been following her blog for about 4-5 years now and I LOVE her recipes. Thanks for the yogurt recipe! I made it last week and we are quite enjoying it. Jill, I am so glad you liked it! 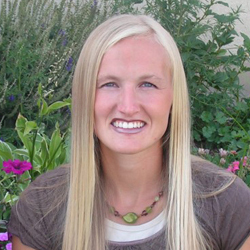 Hi Jill, I am so glad you are liking the blog and the yogurt sorry it didn’t set up the third time. I wonder if it didn’t stay warm enough through the whole incubation process. I do use the Costco yogurt every time as the starter, it has worked for me that way so I just use it every time but I do know you can use what you’ve made as starter and I don’t think that’s why it didn’t set up I bet it was because your water temperature dropped to low and it wasn’t warm enough. What I do each time is I put my jars in my cooler and then I fill my 8 cup measuring bowl up to 8 cups and I put the water in the microwave for about 7 minutes I pour that water in and then get my water as hot as I can get it to come out of the tap, I fill the rest of the cooler up until the water reaches just under the jars lids and then I close the cooler lid and try not to open it. I used to check the temp but I found that adding the extra hot water from the microwave in the begining keeps the water warm enough the whole time. Try it the way I do it and check the water half way through and see if it stays hot enough. I hope this made sense if not let me know and I can clarify. Also if you try this and you keep having trouble let me know and I’ll see if I can help you figure it out.